Here's a video posted on youtube showing how to use Hasegawa's Mirroring Finish. Its basically a sticker that is peeled off then placed on top of the model to give it a metallic mirror like finish. It seems to be thin and stretchable enough that you can use a tooth pick or cotton swab to push it into the recesses of the model's details. The colors available are gold, silver and copper, but there are actually a lot more different types of Hasegawa finishes available. 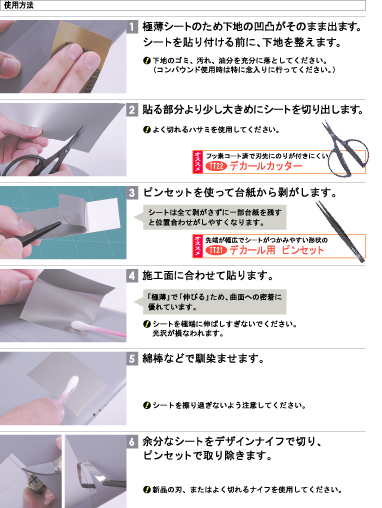 There was also more formal instructions posted at the Hasegawa site on how to use this. There was a cleaning and sanding step of the model added prior to installation, not sure though what type of sandpaper was recommended, I'd assume it will depend on the type of surface you want the model to have. Then a pair of tweezers was used to place the mirroring finish sheet onto the model. You can also use an x-acto knife to cut and peel off the excess portions of the sheet on the model. For riveting, it was recommended to use a small tipped modelling scraper to push the sheet into the small rivets using a turning motion. 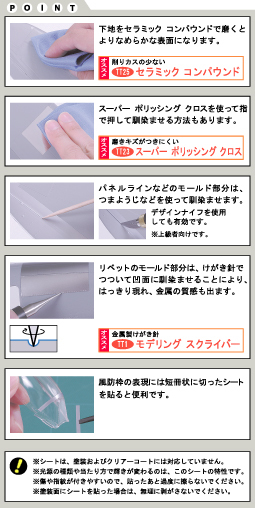 Some pointed but blunt tool, like a toothpic, can be used to sink the sheets into the recesses of panel lines as well.